Ohne Datum, ca. 1983, Specimen eines American Depositary Receipt for Ordinary Shares, o. Nr., 20,3 x 30,4 cm, braun, schwarz, Perforation, Archivstück der Security Columbia Banknote Company. Without date, (ca. 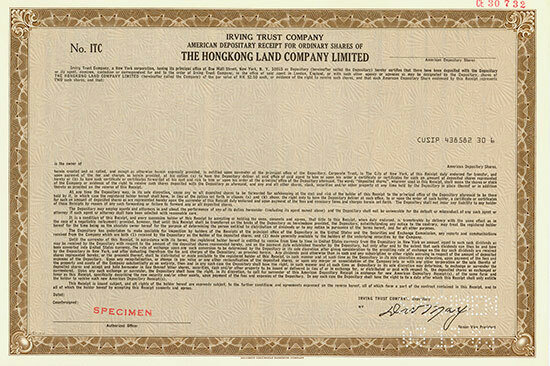 1983), Specimen of an American Depositary Receipt for Ordinary Shares, issued by Irving Trust, 20.4 x 30.6 cm, brown, black, perforation, archive item of the Security Columbian Banknote Company. Die Gesellschaft ist eines der führenden Immobilienunternehmen in Asien. Hongkong Land is one of Asia's leading property investment, management and development groups.